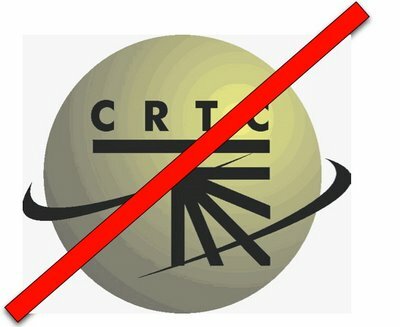 Woke up today was confronted by yet another headline demonstrating why the Canadian Radio-television and Telecommunications Commission (CRTC) must go. For those who’ve never heard of the CRTC, it is the government agency that regulates Canadian broadcasting and telecommunications activities, the best-known of which is probably the Canadian content rules. At the core of the proposal is a fundamental misunderstanding of the internet. The CRTC wishes to treat it like a broadcast medium – one where there are distinct roles of creators and consumers. Happily for us, this is not what the internet is. Instead it is what Clay Shirky describes as a communications medium – one where we are all talking to one another and where the distinction between creator and consumer has broken down. Amid fears that Canada’s culture is being drowned in a sea of online video from around the world, federal regulators are looking at setting up a $100-million fund to support homegrown programming on the Internet… under a scenario proposed yesterday, Internet service providers could be asked to surrender 3 per cent of their subscriber revenue – roughly $100-million – to a fund that would help produce Canadian programs for the Web. Is Canadian content being drowned out in a sea of online videos? I suppose. But so is everybody’s. It is the nature of the medium. What % of content on the internet is American, Indian, Chinese? Does it matter? Not really. Because people don’t surf the internet like they surf the radio or television – most often the seek out content. But the CRTC is used to a certain % of content being Canadian on the radio and television because it controlled how much content ended up on those mediums. This is their frame and why they can’t understand the internet. Ironically, even though we don’t know what % of online content is Canadian what the CRTC cannot grasp is that since the advent of the internet ordinary Canadian both produced more content and – I’ll wager – consumed more Canadian content than ever before. Think of all the blogs, videos, podcasts made by ordinary Canadians that are sharing Canadian stories over the web. Think of this blog. Ensuring Canadian stories get shared is core to the CRTC’s mandate. And yet, for all their discussion about Canadian content the CRTC does not include content created by all those Canadians who’ve previously could never tell their stories. Why? Because none of us have title of “producer” or “writer” or “actor” in the CRTC’s eyes. We (Canadians) don’t count as culture. More ironically, the one thing you often can’t find online (and/or has been slow to get online) is the very media the CRTC does count as culture and that it seeks to protect – the Canadian TV and radio shows broadcast on CTV, CBC and Global. These artifacts of the broadcast era have fought or denied the existence if the internet, who have been the slowest to make their content available to us, now want us to foot the bill for creating their content. What I can be certain of is that the $100 million raised by the CRTC will not go towards Canadians telling their story on the web. My blog, your blog, your podcast, or your video of the play you wrote, none of these will never see the CRTC’s money. Instead a public servant somewhere in Ottawa will determine what is “Canadian” not so we can promote Canadians stories, but so that we can prop the old and dying business model of broadcast media – the expensive production facilities, the hierarchies of managers and staffers that are necessary to produce older media like television. Nor is this is not about protecting artists – writers, actors, singers – they all thrived before the advent of television, and they will thrive after its demise in ways we cannot imagine. Again, this is not about them. It is about an industry trying to prop up a dying broadcast medium and a government agency trying to assert control over what can be defined as Canadian. Both are problematic and have no place in a networked world. As a closing counter factual, imagine a tax on your phone designed to raised funds to ensure a certain % of all phone calls in the world were being conducted by Canadians. A fund designed to pay people to make “Canadian” phone calls. That is what this is. At the very time when we need the internet to be free and as cheap as possible so those with the fewest resources can make use of it to tell their stories, organize protests, create a new business or just find a job, we are going to try to make it more expensive. In short. Are Canadians lost in a sea of content? Yes. And they are thriving in it. More Canadian stories are being told than ever before. Moreover, I never watched Canadian content on television, but today I read numerous Canadian blogs, and listen to the occasional podcast. I never consumed so much Canadian media in my life. Moreover, never has Canadian content been so widely viewed. Readers of even this small blog come from around the world. What we don’t need is a tax that makes it more expensive for ordinary Canadians to tell their stories. We don’t need a levy that props up a dying business model. We don’t need a government agency that defines what is “Canadian culture.” Arguing against this proposal is not the most important battle of our time, but it is worth fighting against. Today Canadian culture is a free culture, increasingly defined and created by Canadians. That’s the promise of the internet, why would we fight that? This entry was posted in commentary, free culture, public policy, technology and tagged blogs, canada, clay shirky, commentary, crtc, free culture, internet, media, public policy, technology, telecommunications commission, web on February 18, 2009 by David Eaves. Tariq – don't apologize for long comments when they are smart and insightful. They are definitely appreciated here in this small corner of the web. This is one of your best posts in a while, Mr. Eaves. We are truly living in two solitudes right now — on that looks forward to a Canada woven into the global cultural mosaic that is the internet, and another looking back at a vision of Canadian culture that probably never existed. A big question for me: do those of us looking forward care enough to engage and stop the insanity playing out at the CRTC this week. I know I've been pretty apathetic, mostly because the whole thing seems a little unreal. Of course for a great critique of the very approach behind this, all we have to do is dig out Mark's old “From VTR to Cyberspace…” piece!What's more shocking than the hearings is the submissions by groups that clearly have little idea what's going on. We may assume that the CRTC has a built-in bias towards more regulation, and control a lot about how all of this goes by setting the agenda of who gets to intervene in high-profile slots…. but nevertheless, they *could* still surprise us and come up with a reasonable (non-regulating) proposal.The orgs intervening? Though this stuff affects their very lives as organizations – not to member their members as individuals – seem to have done very little in the way of a real investigation of what this means to them and how, absent government regulation, they could adapt and thrive. So before we have any decision from the regulator, we have an indictment of the “creative class” in Canada. Sad. One of the authors of the webcomic “Least I can Do” made pretty much the same points. There are other reasons why it is unwise for the CRTC to go down this route; Canada has the advantage of being predominantly English-speaking with a highly educated population but with a relatively small population of the total global population of English-speakers. With the low entry costs to the internet and the high penetration a country like Canada has; the balance of access will be very much in Canada's favour and will remain so for some time. The CRTC proposal will restrict this advantage and would be akin to imposing an 'export tax' for Canadian output on the web. I would say that on average I struggle to wrap my head around the Internet and the implcations of social media in general. How can I benefit? How can my company benefit? How can society benefit? What will change look like and how can we get it right?Even though I struggle with these questions, one thing I clearly see is that the crtc just isn't getting it at all. Before outside-the-box thinking can be applied, one needs to recognize that there is, in fact, a box and what that box looks like even in loose terms and the crtc is clearly missing this here. I like to see things from all angles, and after a long struggle, I finally found a way to rationally explain the CRTC's involvement in a positive way.The premise is that they want to help foster Canadian content through this fund. The wrong way to go about it would be to funnel the money back into the standard media producers to help them create web content that most Canadians would ignore, similar to TV productions that are aired to satisfy Can-Con requirements and draw dismal ratings.Is there a right way? Eventually one came to mind. Use the fund to help distant communities to get connected with the rest of the Internet world. You'd give Canadians in those communities opportunities they've never had before, expanding the number of Canadians online, and thus enabling them to create content in the modern sense of word. Indirectly, you would be satisfying your initial mandate of generating more Canadian content on the web, as well as “plugging in” a whole new segment of Canadians otherwise left out of the loop. It's frustrating to see Canadian culture go underrepresented on the WWW. The NFB is barely releasing some of its content online. If it werent for overly restrictive copyright law, ordinary Canadians with VHS or reel tape in hand could be digitizing our cultural film history and putting it on YouTube for the world to access. I like how Stephane is thinking. To me the key point is that we recreate a kind of corporate welfare system for the private broadcasters. I agree that we should not be propping up these entities from the broadcast era. This is very similar to the way big telecom companies are trying to make the Internet more like the past mediums that had more control over. They are in a similar sense, trying to impose a TV model on content distribution on the Internet. I agree totally with this post. Canada cannot be a truly multicultual nation when we have cultural administrative bodies like the CRTC trying to ram a totally artificially created “Canadian” monoculture down citizens throats. I respect the passion that you've poured into this, but have to disagree with much in this blog posting (and in the Globe article it's relying on). I know a number of the folks who work at the CRTC, and they understand the Internet pretty well. The CRTC isn't reviewing its approach to audiovisual material on the Internet because it has a particular animus; it's doing so because it is required to by law.The CRTC doesn't think anyone is “drown[ing] in a sea of online video from around the world”; that's a characterization of the interveners of what the interveners that have appeared before it have been saying, Except that that characterization is wrong, too — said interveners have been saying that, as with a number of other industries (forestry, auto, pharma, whatever), Canadian creators of scripted audiovisual content don't have the economies of scale to compete with U.S. producers who can afford to waste literally millions in failed pilots and scripts and so forth. Aall the blogs, videos, podcasts made by ordinary Canadians that are sharing Canadian stories over the web are great, except that the CRTC has said in very explicit and in no uncertain terms, over and over again, that has no interest in getting involved with user-generated content — that stuff is doing just fine on its own — its interest is in reviewing evidence with respect to production of the kinds of things that actors act in, directors direct, scriptwriters write, and so on. Which is a tiny corner of the Intertubez, but is the only corner the CRTC is really looking at — and is one whose production costs don't change much as a result of the Internet.Instead a public servant somewhere in Ottawa will determine what is “Canadian” not so we can promote Canadians stories, but so that we can prop the old and dying business model of broadcast media – the expensive production facilities, the hierarchies of managers and staffers that are necessary to produce older media like television. What evidence do you have that ppl don't want to watch scripted audiovisual content? All the actually-existing evidence — more film consumption, Hulu traffic growing leaps and bounds, an increasing proportion of Youtube's growth coming from stuff produced by people who spent serious time and money it — points in the opposite direction. If a fund is created — what you need to understand is that that is the proposal of interveners before the CRTC, not of the CRTC itself — then it will likely be administered in the way the Canadian Television Fund and Telefilm are. You're right that this money doesn't go to those who would create the content anyway and don't need help doing it. But why the heck should we pay for that? If something is to be funded, it should go to artists and creators doing stuff that the marketplace wouldn't support and free time is not enough to accomplish. I do understand the free-market model you're advocating — unlike the auto or forestry or solar-power sectors, cultural production needs to be unsubsidized and make it or break it according to the rules of dollar bills — but that does not mean I agree with it.We don’t need a government agency that defines what is “Canadian culture.” Indeed. But you're struggling mightily against a straw man here: we do not have one. The CRTC has never attempted to define Canadian culture, just required that gatekeepers (radio and TV stations) reserve some of their airtime for culture created by Canadians. All the scare stories in the papers aside, it's not going to do that where there are no gatekeepers (open Internet access). Cell phones, Xbox 360, and other locked hardware devices whose programming decisions are made by gatekeepers, well, we'll have to see. You're barking up the wrong “they”, Stéphane. The proposed fund ain't the CRTC's proposal. The CRTC is a dinosaur that had a questionable rationale for its initial incarnation as a regulator of content. The world has now unalterably changed and the CRTC like King Canute is thinking of ordering the tide to retreat. The only solution is to eliminate the CRTC, lock stocj=k and barrel. It is unwanted and unloved by most Canadians. The CBC should follow the CRTC into the dustbin of history for the very same reasons.